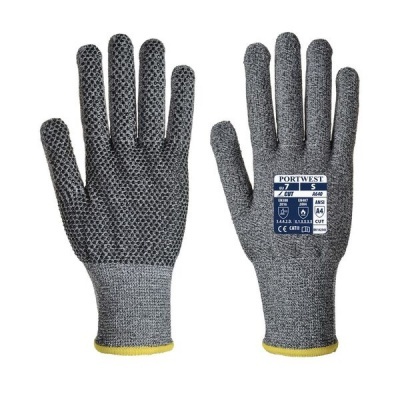 Offering exceptional level 4 cut resistance, the Portwest Sabre Cut-Resistant PVC Dot Palm Gloves A640 combine a PU dot palm coating to enhance grip and a lightweight and flexible construction to boost productivity during general handling applications. Their inner liner means that the hands can stay comfortable and cool during use, while their heat-resistant properties protect hands from temperatures of up to 100°C. The Portwest Sabre Cut-Resistant PVC Gloves A640 are available in four sizes that should suit the hands of most users. Please measure the circumference of your hand around the knuckles (excluding the thumb) with your hand open and your fingers together, and the length of your hand from the tip of your middle finger to your wrist.